CW Studio led a team to design a concept for a technology-led street in Croydon for a design competition run by the Architects’ Journal and Croydon Council. We assembled a wonderful team made up of Falconer Chester Hall Architects, Chris Mullany Creative Technologist and Light Collective, plus suppliers Vestre Street Furniture and Hardscape, and were delighted to be shortlisted as one of six teams out of over sixty entrants. 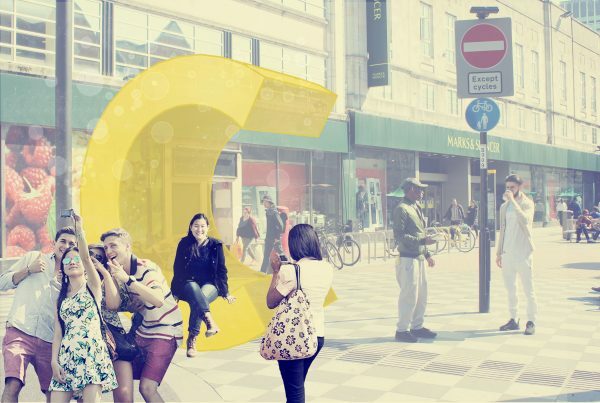 Our Croydon iStreet proposal is a bold and playful technology-led installation, bringing life to the public realm, and creating an exciting destination for visitors. 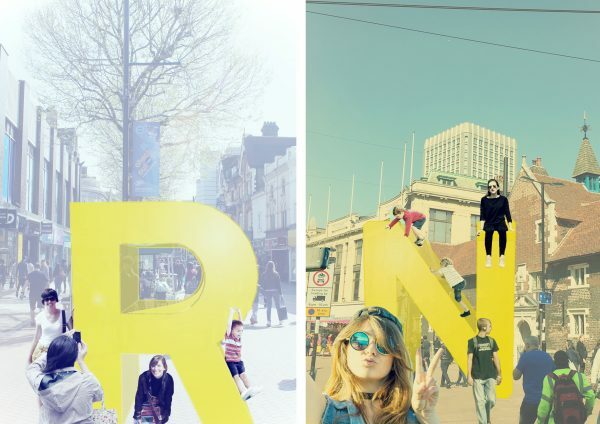 Large, sculptural yellow letters spelling CROYDON are placed on a route through this historic market town creating an urban treasure hunt. The distinctive golden yellow colour is chosen to reflect the town’s historic connection with the saffron trade. 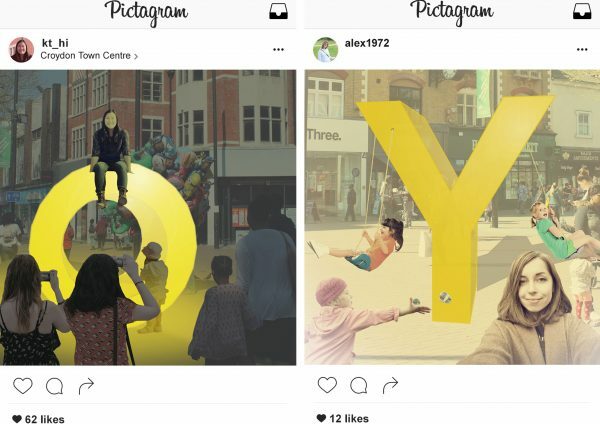 These vibrant, bold letters are simultaneously street furniture, play elements and sculptural pieces, creating a fun and unique way of experiencing the town. They encourage interaction between people, whether friends or strangers, changing behaviour and celebrating the street. Each sculptural letter contains innovative and integrated new technology, enabling it to sense the presence of people, and respond in a variety of ways. Passive ambient soundscapes emanate and react to the number of people engaging with the letter. At night, LED lighting incorporated in the surface is responsive to the nearby sounds and movements of passers-by, glowing and pulsing and drawing people in. When near a letter, bluetooth technology will connect with the #CROYDON app unlocking visuals, videos, and stories relating to the history of the adjacent building, events on that weekend, or the location of the next letter on the trail. The installation seeks to make interesting public spaces a priority by exploring the stories and history of Croydon, animating public space, encouraging interaction and celebrating outdoor places.